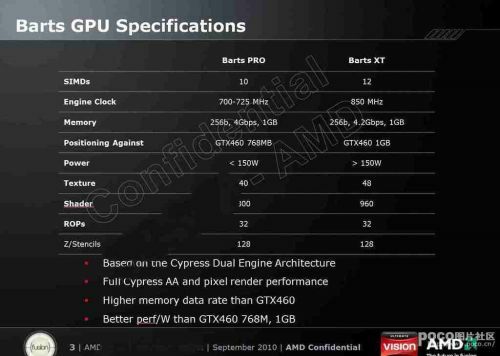 Take these specs with a grain of salt because of the source and the bad photoshop image! AMD Radeon HD 6770 (Bart XT): 960 shader processors, 12 SIMD (80 shader processors per SIMD), 850MHZ-GPU, 32 ROPs, 48 texture units. AMD Radeon HD 6750 (Bart PRO): 800 shader processors, 10 SIMD (80 shader processors per SIMD), 700-725MHZ-GPU, 32 ROPs, 40 texture units. If true, the 6770 could be like 10% shy off the 5850. Not bad at all. The GTS 450 is not that bad either. Barts XT is a codename mate. There is also a Juniper XT, which is the chip found on the 5770.